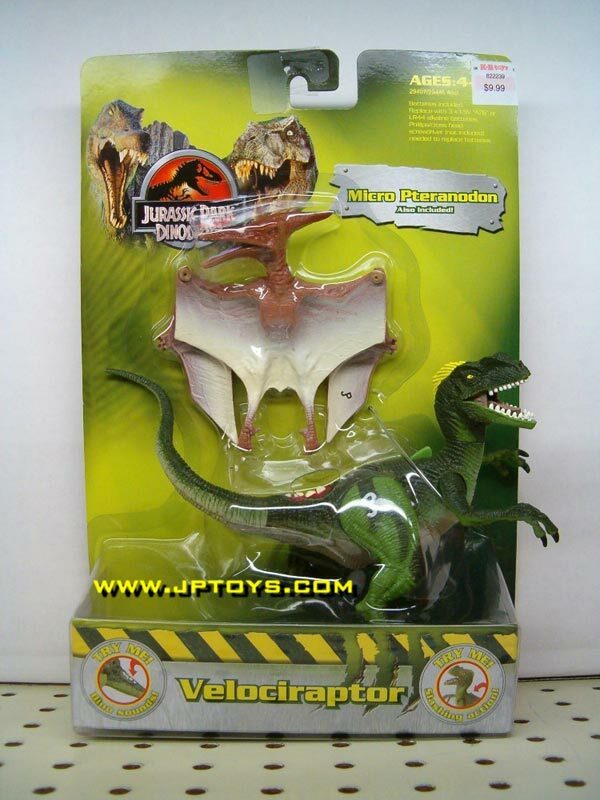 Description: this Raptor figure stands in a dramatic pose when boxed, showing all its primal predator prowess, its body straight upwards, its legs wide apart and its ferocious claws ready for action, while its head faces upwards and is turned to the right, jaws wide open (and not capable of being closed). The tail is bent in a sort of 'S' shaped fashion. This sculpt has proto-feathers on the back of its head, following the design change of the Jurassic Park III Velociraptors as compared to the Raptors seen in the first two movies. Accordingly, it has a nasal ridge on each side of its head. A dino damage wound is located on the upper base of the tail, revealing some of its tail bones and dark red muscle tissue. Inside the wound a button is found: when pressed this produces a snarling sound. On its back this creature has a small lever, activating the slashing claw action feature. This also produces an eerie shrieking noise. Apart from the figure's underside (the belly, most of the lower part of the tail, the inside of the upper legs and part of the throat), which are coloured beige, this Raptor looks quite green. Most of the animal is coloured dark green, most notably all of the head apart from the lower jaw, the back and the upper side of the arms and tail. The remaining body parts are painted in a much lighter shade of green, which is found mostly on the legs, underside of the arms and part of the neck. Dark green stripes also run over the legs. The proto-feathers on the back of the head are yellow, as are the eyes (with black pupils). The tongue and parts of the side of the mouth are pink and the teeth are white. The claws on both hands and feet are painted black while the figure carries white JP logos on both upper legs. The Pteranodon is rather large for a creature that originally came with a human figure. The second half of each wing can fold in and out, and when folded to their full (realistic) length, the figure has about a 15 centimetre wing span. It has a small hand on each wing, which however is situated far too much towards the end of the wing and should have been placed closer to the body. The Pterosaur has two long legs which end in claws that can grip human or dinosaur figures' limbs as if it is lifting them off the ground. It has a rather thick plump head on a rotatable neck. Most of this figure sports a brown paint job, mostly a darker shade of brown, though there's also a lighter shade mixed in on various parts of its body (most notably on the chest, arms and head). The underside of the figure (lower side of the wings, tail and most of the legs) is white, which gradually shifts into light brown the closer you get to the arms. The claws on the hands are painted black, while the Pteranodon has red eyes, a purple tongue and a small black JP logo on both the upper and lower side of its left wing. Analysis: once again it seems Hasbro thought a JP toy line would be incomplete without a decently sized Velociraptor figure, so they bashed out yet another repaint (instead of creating a new figure). This sculpt was used only the year before, but either Hasbro forgot, didn't care or thought kids wouldn't remember (but most likely all three options combined). This Raptor is very green, which actually suits it rather well, considering green was never really a “Raptor colour” as the previous Raptor figures in this colour indicated. The dark, murky quality of the used combinations of green is rather reminiscent of the scrapped Camo-Xtreme Tropical Velociraptor and so this latest try might make up a little to some people for the loss of that particular figure. The creature is also pretty detailed, as all the claws and the proto-feathers have been taken care of. The yellow on the Raptors' back of the head is a nice little touch, and it would have been nice if a similar colour scheme would have been added to the head (particular the nasal ridges) since this still looks a bit dull. Compared to the Camo-Xtreme Night Raptor, the two sounds have been reversed again, so they're in the same order as they were on the original JP III figure. And the good old slashing claws remain the same: cute, but not particularly effective. The Pteranodon is much more disappointing, considering it is a total reuse instead of just a repaint. If you already own the Pteranodon and Compsognathus two-pack of this toy line you'll find it a boring and unneeded addition to your JP dinosaur collection. And the paint job is, again, very bland. It makes good prey for the hungry Raptor, if the Pterosaur was ever stupid enough to get too close to it's vicious claws. Repaint: yes. Both figures are repaints of JP III dinosaur sculpts. The Pteranodon originally came with Eric Kirby, while the Raptor was originally the Alpha Velociraptor of the JP III line. The Raptor has been repainted before for Camo-Xtreme and JPD2, and the exact same Pteranodon (identical sculpt and paint job) was featured in the Pteranodon and Compsognathus two-pack of this line. The Raptor would be repainted again for JP 2009, but for the Pteranodon, this would be its last appearance (so far). Overall rating: 5/10. The Raptor looks decent and is fairly detailed, but otherwise no different than before. The Pteranodon, already suffering from a lousy paint job, unfortunately is identical to the other Pteranodon figure of this toy line, making it redundant and uninspired. Like the other JPD2/3 electronic dinosaur figures, this two-pack was very common a few years ago, but has since become increasingly hard to find, despite not being a very popular set. If you really want one, patience is certainly required, but fortunately it doesn't necessarily require a lot of cash once you've found it.